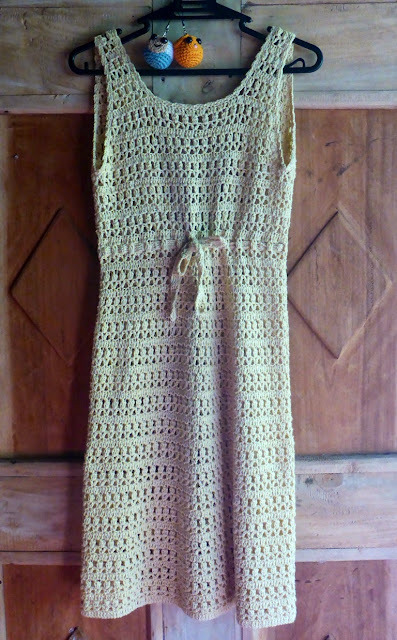 Some of you might have encountered crochet patterns for dresses that include only the stitch pattern and a photo of the dress. 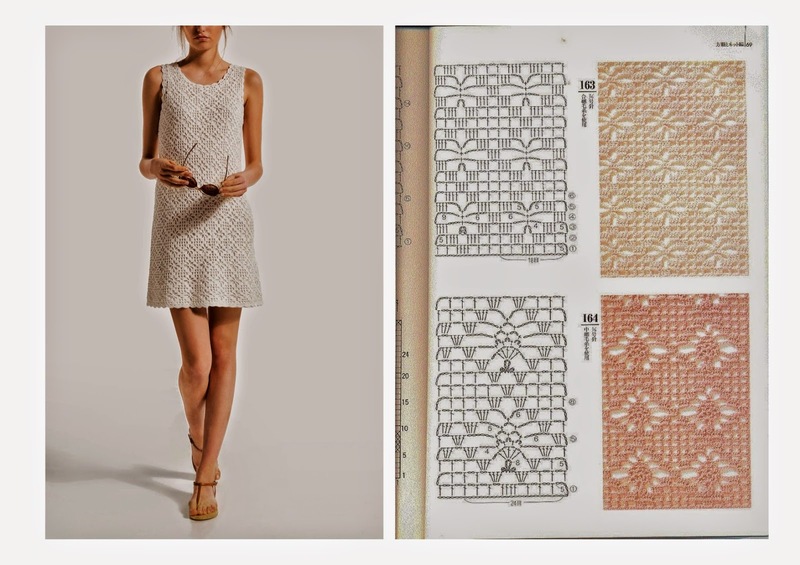 If you are lucky, there is a dress schematic with measurements. 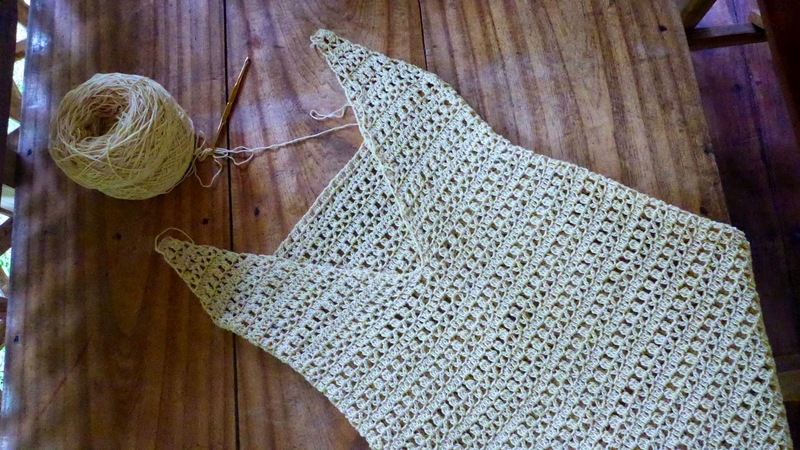 You might also be given some basic information such as the yarn to use and the hook. Examples of such patterns are below. 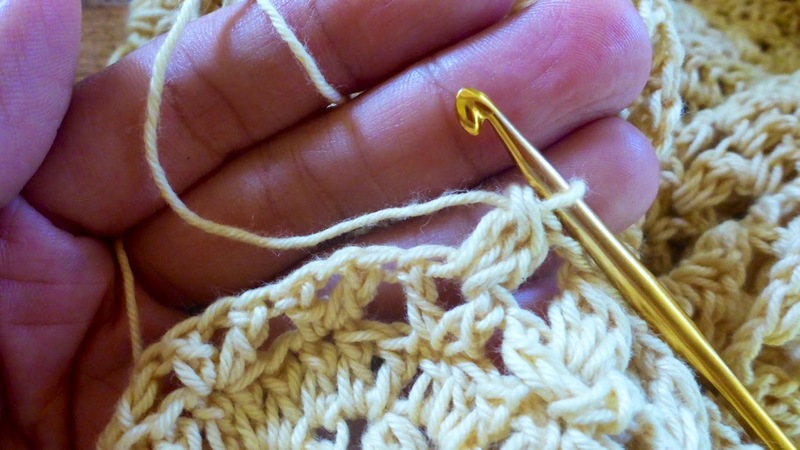 Experienced crocheters have no problem with these patterns. They can tell more or less, using their hook and yarn of choice, how many stitches they need to begin the dress of the size they desire. They can also make the shaping (increase and decrease) without prior planning – they just ‘wing it’, or make the shaping as they go. 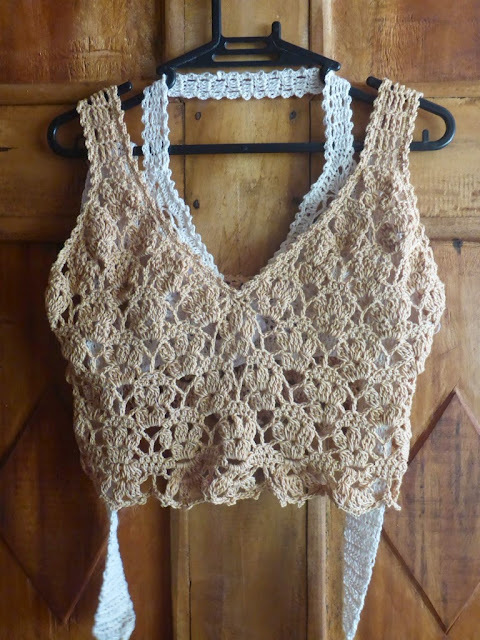 I used to make crocheted garments in this manner, spontaneously and without planning, modifying stitch patterns, mix and match, improvisation. 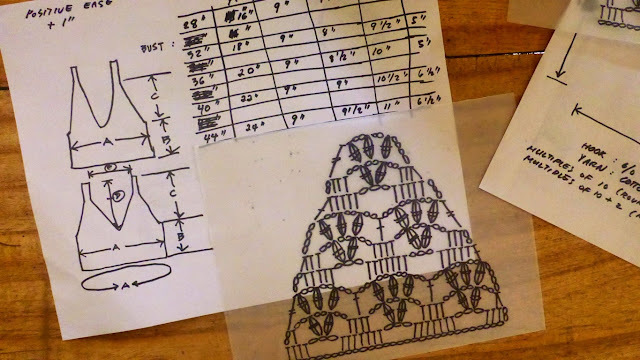 However, if you want to write a pattern, or if you want to make the same design for different sizes, you will need a bit more planning. I would like to try a simple example. 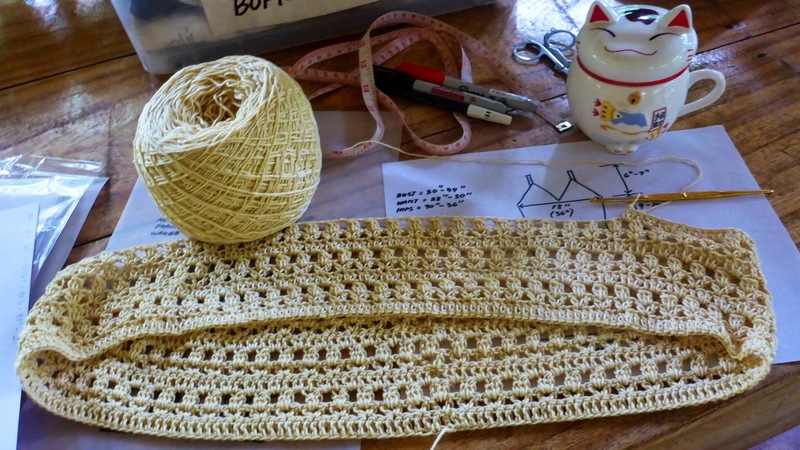 A number of things are needed when I work with a stitch pattern. First, I need the stitch pattern and learn a number of things about it, like how may multiples do I need for a foundation chain/stitch? The multiples may change if you are using the stitch pattern in rows or in rounds. 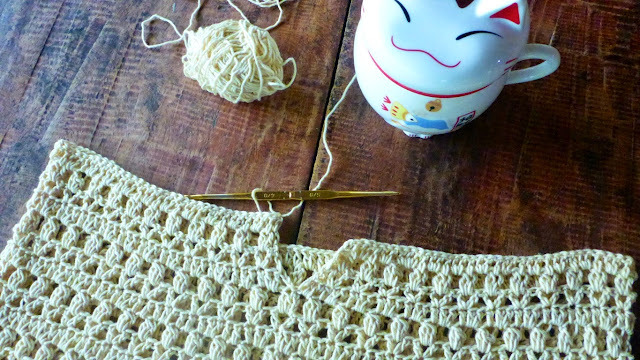 Next, I need to know how many stitches and rows make up 4″ square of the stitch pattern. Or at least, I need to know the measurements (width and height) of the stitch pattern worked over a given number of stitches and rows. This means making a gauge swatch using the yarn and hook I intend to use to make the dress. Next, if my dress design requires shaping, I will need to know how the stitch pattern may be modified in order to make the shape – this usually means increase and decrease of stitches. I also need to know if it will be a very steep, sudden increase/decrease or will it be gradual? How many inches change in measurement do I need to make over how many rows? Do I make the shaping in rounds or in rows? 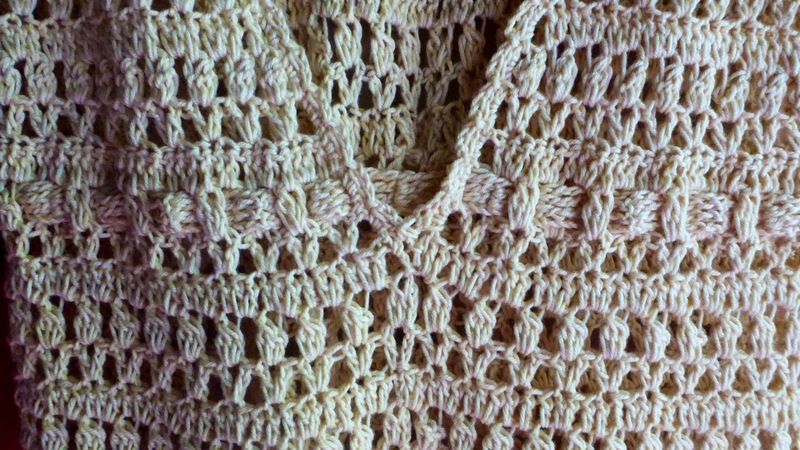 The stitch pattern modified to create shaping. Shaping required is based on shape of garment, so a schematic of the garment with sizes must be made. Of course, we need to know the shape of the dress we are making. This is where you will need a schematic indicating the measurements of the finished dress and for what size the dress is being made. 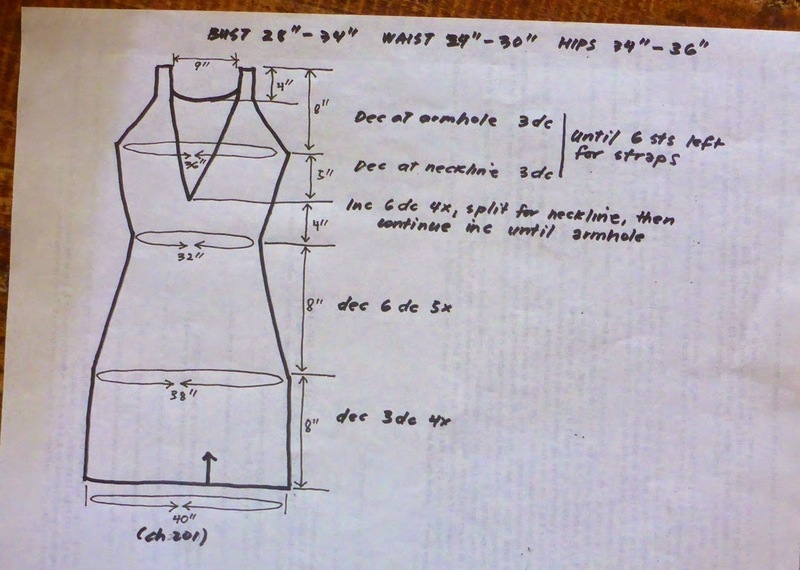 You can use your own measurements and plot that in your dress schematic, or you can use standard sizes if you are making dresses in other sizes and not just your own. 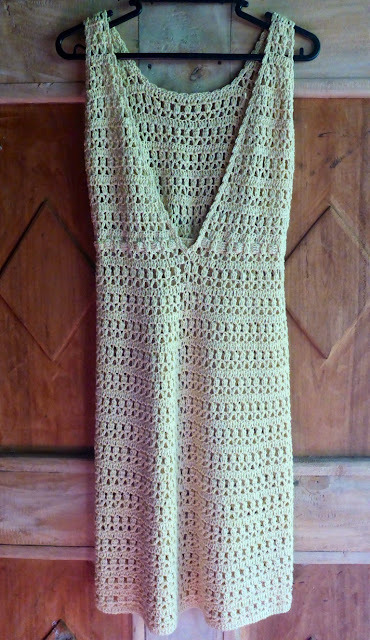 The finished garment based on the given stitch pattern. I want to make a mini dress. Here is my stitch pattern, gauge swatch and schematics. 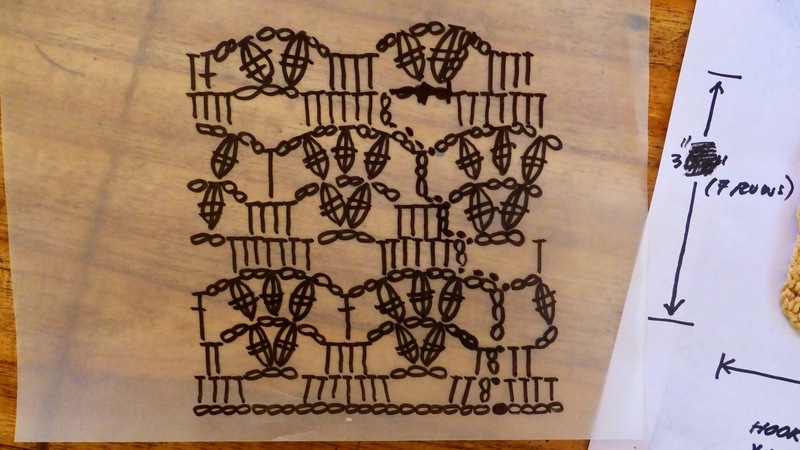 Here is the stitch pattern I want to use for the dress, I have modified it to make the shaping. Here is the stitch pattern I want to use for the dress, I have modified it to make the shaping for the armholes and the V-neckline which will be worked in rows. 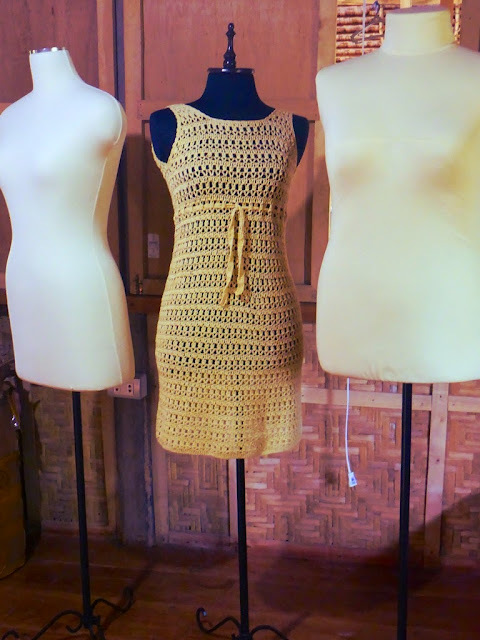 The skirt and body of the mini dress will be worked in rounds and shaping is made by skipping (to decrease) or adding (to increase) stitches along the round of dc stitches. Gauge swatch and schematic of desired measurements for a mini-dress. Gauge swatch and schematic of finished measurements for a mini-dress. The schematic also shows the number of stitches and rows needed for the measurements. This is calculated on the basis of the gauge swatch. 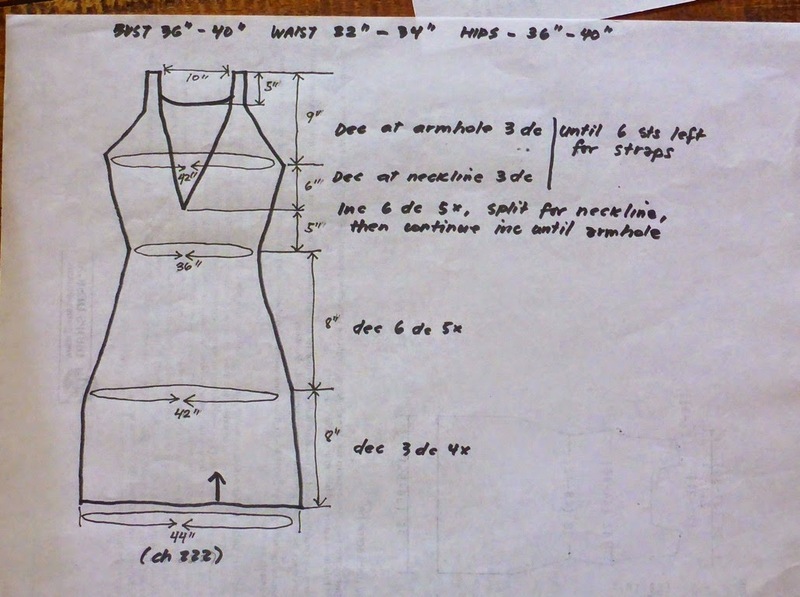 Remember, this is finished measurement of a mini dress and the actual body measurements are smaller. I want positive ease for this mini dress, I don’t want a fitted dress. 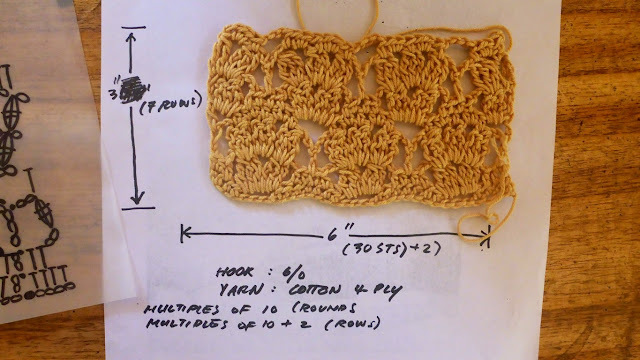 Hook, yarn and stitch specifics are important when making a gauge swatch. 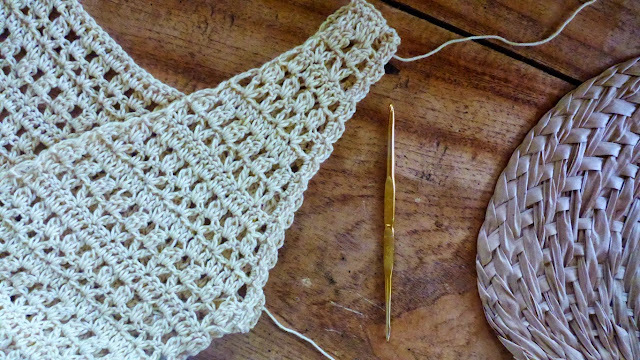 Hook, yarn and stitch specifics are important when making a gauge swatch. Here is the hook I use, 3.5mm. The yarn is 4-ply cotton. 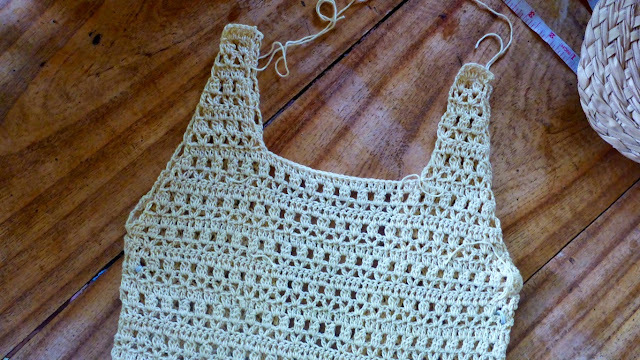 Mini-dress: Work in progress. The dress is worked in the round from the bottom up. Mini-dress: Work in progress. The dress is worked in the round from the bottom up. 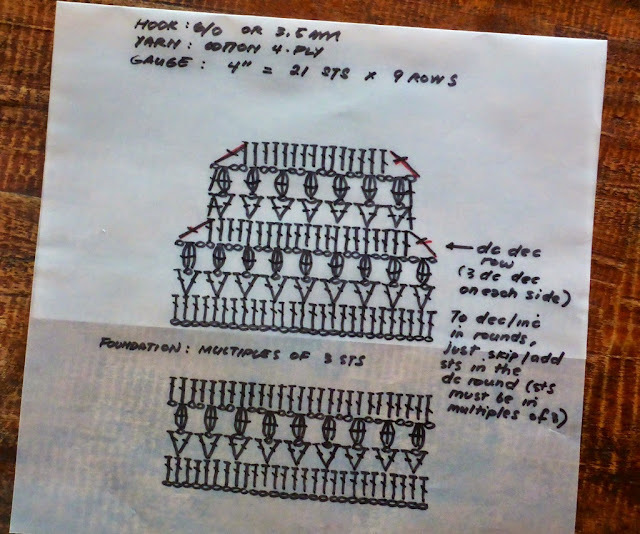 I want 40″ around the hem of the dress, so I start with ch 201 (stitch pattern must be in multiples of 3 sts). I also allow for a bit of extra space because I don’t want a fitted or tight-fitting dress. I always measure while working, and because the weight of the yarn will pull the dress downwards, I measure while holding up the dress. Here, subtle shaping towards the waist is made. I always measure while working, and because the weight of the yarn will pull the dress downwards, I measure while holding up the dress. Here, subtle shaping towards the waist is made. Then I split to begin the plunging neckline, now working in rows instead of rounds. This is a more detailed schematic that I made showing measurements and the number of rounds/rows worked. This fits bust sizes 28"-34". And this is a more detailed schematic that I made showing measurements and the number of rounds/rows worked. This fits bust sizes 36″-40″. This is my edited crochet symbol chart showing shaping (decreases) when working in rows, and some notes about shaping when working in rounds. This stitch pattern is very easy to shape. The plunging neckline is crocheted in rows, until you reach the armpit. From there, you need to work on one side of the front toward the strap, then fasten off. You join the yarn to work the other side towards the other strap then fasten off. Then you join the yarn again at the back and work upwards. Here a simple edging is made all around the armholes and the neckline. I chose a loose, not tight, edging of two rounds. First round is 2sc along row, ch 1, 2 sc along next row, etc. Second round is ch 3, sc in ch sp, ch 3, sc in next ch sp, etc. Very simple! The finished mini-dress showing the back. This can also be worn at the front with a low back design. I decided to add this slim crocheted belt to create a gathered empire waist look and draw attention away from my large tummy. Here is the front of the finished mini-dress, this is intended to be worn with a matching top or perhaps a suitable dress. It's also nice to wear this plunging neckline at the back instead for that low back style. 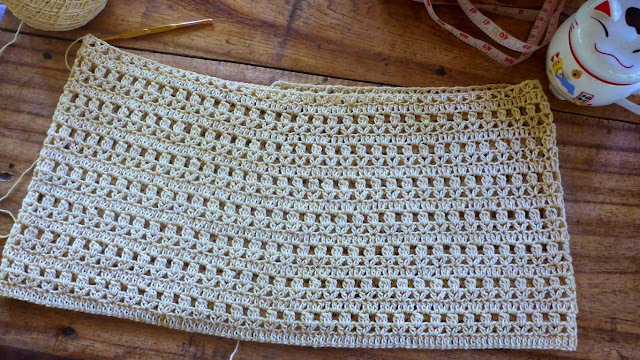 A closer look at the crocheted belt, woven through one of the dc-cluster rows lying above the waistline. A closer look at where the dress splits from working in rounds to working in rows to make the plunging neckline. Thank you ,beautiful pattern . Wow! I'm learning so much from you and i'm saving this post, forgive me. 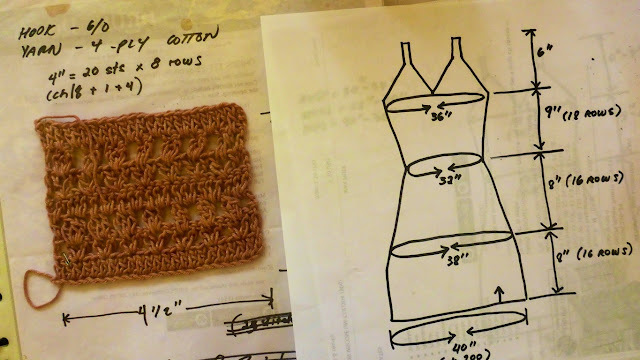 One question though: when crocheting a gown, do you Crochet the front and back separately and also do you use machine to join the front and back? Two questions!!! 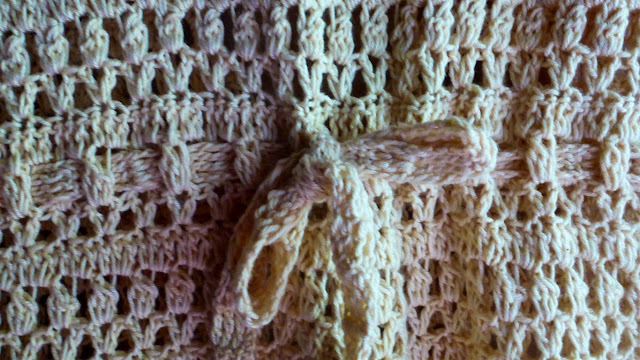 Oh I sometimes crochet two sides, front and back, then seam along the sides with simple mattress stitch (with yarn needle and matching yarn) or I crochet the seam, usually sc or sl st. In this project, the dress is crocheted in the round, in one piece, to avoid seaming along the sides. Sometimes I don't like to sew side seams. Nice sharing.. I want to learn making my own design dress.